There is a lot to unpack in this bit of news. I’m going to start with the “party of Lincoln” reference by House Minority Leader Kevin McCarthy (R-Calif.). McCarthy averred King’s latest racist remarks are “not the party of Lincoln.” The implication is, other than Steve King, today’s Republican Party is Lincoln’s party, as many of today’s Republicans love to claim. But that is hogwash, to use the language of Lincoln. If Honest Abe were here today, he would be chastising his former party. I say former because if he were here today, he would have withdrawn from the GOP in an Illinois second. Today’s Republican values are antithetical to Abraham Lincoln’s values. If Senate Majority Leader Mitch McConnell (R-Ky.), former House Speaker Paul Ryan (R-Wis.), President Donald J. Trump (R-N.Y.), and the rest of them were in office in Lincoln’s day, they would have capitulated to the South and slavery would have been legal for another half-century. There’s no way today’s Republicans would have supported Lincoln’s policies and voted for the Thirteenth Amendment in the political climate of the mid-1860s. So the Republican Party is the party of Lincoln in name only: POLINO (“poe – LIE – no”). Like RINO (“RYE – no”), Republican in name only. RINO is the opprobrious term right-wing conservatives and white evangelicals like to call members of their own party who show any modicum of moderation or compromise. The next time any Republican references their party as the party of Lincoln, you yell out “You lie!” — no wait, that was GOP Rep. Joe Wilson (R-S.C.) at President Barack Obama’s 2009 State of the Union Address to a joint session of Congress. Classy. No, you yell out “POLINO! Party of Lincoln in name only!” That’ll get ‘em. 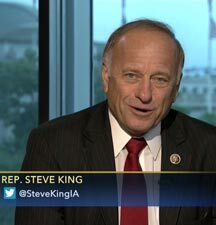 Steve King Denunciation: Why Now? But the final straw for congressional Republicans? I guess Steve King’s 2018 endorsement of the neo-Nazi slogan the Fourteen Words (“We must secure the existence of our people and a future for white children.”) wasn’t that bad. I mean, Republicans in Congress really wanted to be fair before denouncing a fellow GOP legislator for racism. Besides, it had only been 12 years since he called illegal immigration a “slow-motion Holocaust” — and demonstrated a model of an electrified border wall on the House floor stating, “We do that with livestock all the time.” And besides, besides, he’s only been making those types of public comments a few times per year since then. That’s what finally did in Steve King from Iowa. As you can see from the King quotes above, there was and is no doubt about what Steve King stands for. — Deferred Action for Childhood Arrivals (DACA) program (both vehemently fight this policy by disparaging most of the prospective recipients). So why, only now, after all these years, condemn the bigotry and hatred of GOP Rep. Steve King but continue to ignore — and even enable — the same bigotry and hatred spewed by President Trump? The reason is that turning against Steve King, long after polite society has done so, will not cost Republican elected officials politically. It might help some of them. Their condemnation of Mr. King — way late but better than never — is a reflection of their fear that racism is becoming perceived as a Republican Party platform plank. But they can’t condemn the president because they fear being primary-ed in their next election by Trump’s base. Look at Sen. Lindsay Graham (R-S.C.) who is up for re-election in 2020 and has done a complete about-face toward the president. He used to call Trump “a kook” and “unfit for office.” Now he denigrates those who call the president “a kook” and “unfit for office.” Scores of Republican pundits and other political thinkers are astonished at Graham’s blatant hypocrisy. But they understand Lindsay’s naked political survival tactics, free of any ethical restraint. So Republicans are riding the hypocritical fence. Steve King: Bad. Donald Trump — who is just as bad if not worse: Good. We try to give the subject of Russia a break. Then what happens? Two of the biggest stories to date emerge that take your breath away — that is, if you have any semblance of a caring American wanting the best for our country. In the days following this article, pundits and foreign policy experts have near-concluded that Donald’s obstruction of justice is the collusion, and that the president of the United States is a national security threat. He has been obstructing the investigation — not only to cover up his own complicity but also — to cover up Putin’s efforts to steal our election for Trump. — July 7, 2017: President Trump attended the G20 summit in Hamburg, Germany, during which he had a private sideline meeting with Russian president Vladimir Putin. This was a second, initially undisclosed, near-one-hour meeting. Trump spoke through Putin’s interpreter — the U.S. interpreter only spoke Japanese (apparently, each leader was allowed only one interpreter at the dinner). There is no U.S. record of the discussions during this meeting. Only Trump, Putin, and the two interpreters were present. Neither Donald nor the American-Japanese translator took notes. — July 8, 2017: While President Trump was flying home from the Hamburg summit on Air Force One, we now know he personally dictated a false media response — under Don Jr.’s name — to address news reports that three of his top officials had met with Russians during the campaign. — July 8, 2017: Also while President Trump was flying home from the Hamburg summit on Air Force One, he made a personal phone call to a Times reporter to convince him that Vladimir Putin has been falsely accused of meddling in the 2016 U.S. presidential election. The burning question presented by this timeline and what we now know is this: Did Putin direct Trump to take these two actions: lie about the Trump Tower meeting and lobby the Times in favor of Putin’s innocence? “President Trump has gone to extraordinary lengths to conceal details of his conversations with Russian President Vladimir Putin, including on at least one occasion taking possession of the notes of his own interpreter and instructing the linguist not to discuss what had transpired with other administration officials. … Trump did so after a meeting with Putin in 2017 in Hamburg [the first of two] that was also attended by then-Secretary of State Rex Tillerson. U.S. officials learned of Trump’s actions when a White House adviser and a senior State Department official sought information from the interpreter beyond a readout shared by Tillerson. Additionally, consider the favors President Trump has done and is doing for Vladimir Putin: 1) changed the GOP platform to favor Russia; 2) compared Russia’s authoritarian tactics (such as murdering journalists and dissidents) to America, saying we’re just as bad; 3) has continued to mirror Russian propaganda points throughout his campaign and presidency; 4) slashed the U.S. State Dept. budget and purged its Russia experts; 5) supports Brexit and weakening the EU; 6) has undermined Germany; 7) supports Russia’s readmission to the G7 intergovernmental forum (they were thrown out after they invaded Ukraine); 8) is withdrawing troops from Syria; 9) defended Russia’s invasion of Afghanistan; 10) promotes far-fetched, pro-Russia foreign policy canards (e.g., Poland is preparing to invade Belarus, Montenegro is a threat to its neighbors); 11) bashes and threatens to withdraw from NATO; 12) is lifting Russian sanctions; 13) continues publically to negate Russia’s interference in our elections (believes Putin’s denials); and 14) is obstructing the special counsel investigation, to cover up Russia’s involvement in U.S. election interference.